Work is being carried out to extend the tramway up Talbot Road from North Pier to Blackpool North Station. 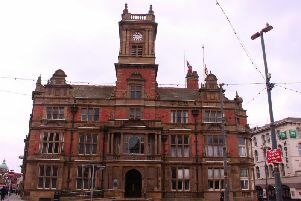 The scheme is funded through £16.4m from the Lancashire Enterprise Partnership and £4.7m from Blackpool Council. It’s one of four projects to improve Blackpool town centre, with land on Tower Street earmarked for the second phase of the Houndshill Centre, including a new Wilko store and cinema. That will pave the way for the demolition of the existing Wilko store on Talbot Road where a new tram terminus and hotel will be built. Work is also underway on the redevelopment of the former Sands cabaret venue into a five star hotel. Work started eastwards from Talbot Square in April and Talbot Road will remain closed between the promenade and Abingdon Street until August 31. The junction of Talbot Road and Abingdon Street closed this week and will be shut until August 22, with traffic diverted through St John’s Square. The section of Talbot Road between Abingdon Street and Dickson Road will be closed from September 3 to November 30. Tram tracks have now begun to be laid – with the old tracks from decades ago also briefly still visible – and their laying is set to be completed early next year. The track which previously ran from North Pier to North Station along Talbot Road ceased operation in 1936. Blackpool Transport is buying two new trams in time for the opening of the new link, to bring its Flexity fleet to 18.